Shooting seascapes for 5 years now, there have been some very near misses which could have easily ended in disaster. More than I’d like to publicly admit. Back before picking up a camera, my main hobby was open water swimming in the Irish sea. The rougher the conditions, the better. It made the swimming more fun and invigorating as the waves bashed us around. Today, I relish the same conditions in my photography. Photographically speaking, I’d rather face rough stormy conditions with huge waves over a beautiful sunset each & every single time. These conditions are tougher to work in but far more rewarding. For me, there is far more drama to be captured & these images tell a deeper story, holding the viewer’s attention longer. They are more than just a pretty picture. Swimming in the open sea meant I didn’t have any rocks to content with. Seascape photography is a different affair. Rocks are everywhere to be found. We use them to our advantage as foregrounds, central subjects, leading lines and even backgrounds. Although photographically very useful, they are also the most consistent health & safety threat encountered. 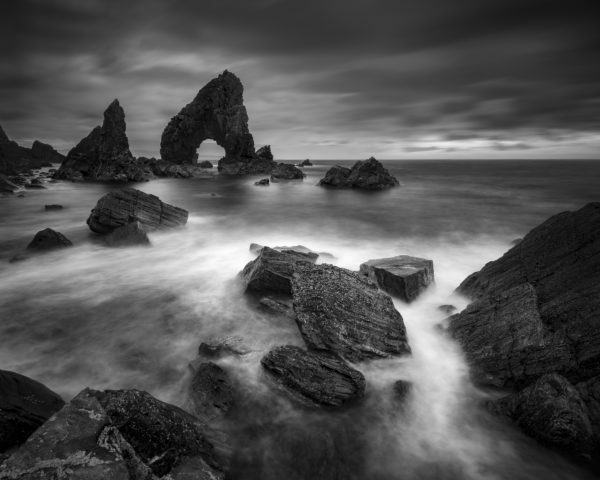 I’d like to impart 3 simple seascape photography tips which will help keep you safe when shooting seascapes in any weather conditions. One simple misjudgement could end in disaster, ruining both your body & your camera equipment. These really can’t be avoided if you like getting close to the action. They can be wet from waves washing up or rainfall. Either way, they need to be treated with the utmost of respect. If possible, avoid standing on them. When gauging how close I can get to the water with a receding tide, I simply stand for a few minutes and watch how the waves wash in & out. If the rocks are wet, a wave has hit them at some point recently & it’s very likely to happen again. Experience has thought me to stay clear. I simply don’t venture onto them anymore if the swell is anyway rough. The technique of waiting and watching cannot be relied upon if the tide is in-coming – even more caution is required. Longer focal lengths are the safer bet…. I’ve scrambled across all types of rock in my endeavours to get better images. Dry rocks pose a unique threat of their own – stability. Regardless of their size, you can never really tell just how secure and balanced a rock is. I’ve had a few surprises over the years. Instead of blindly bouncing from one rock to the next, I advise taking your time and accessing the stability of each rock one by one. Simply apply a little pressure with your foot or an extended tripod before committing your entire body weight. My pet hate, it’s a slippery little devil even in dry weather. My advice, simply try and stay clear of walking or even standing on it. 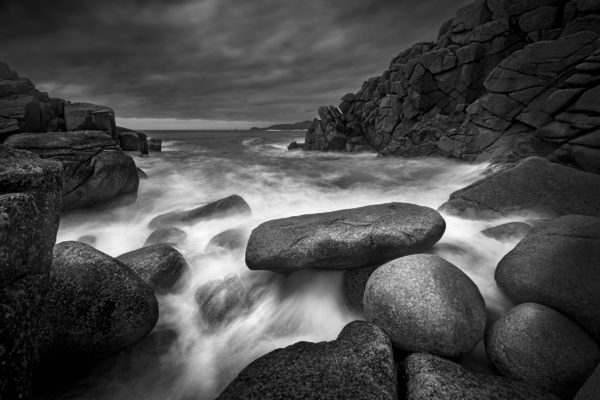 That’s it – 3 simple seascape photography tips that will help you stay safe even if I do bang on a little too much about rocks!! Help me spread the word!! I hope your enjoying these articles – I’d appreciate if you could subscribe to them on the right hand corner above or follow me on Facebook where you will automatically be notified when I publish a new blog.